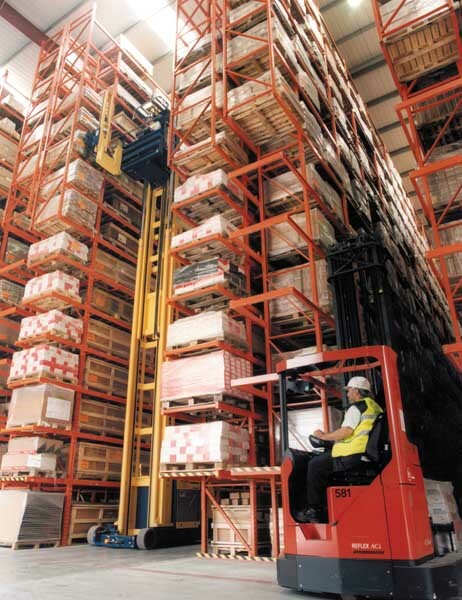 When Redirack completed the installation of a narrow aisle, high bay scheme at Avocet Hardware’s National Distribution Centre the project was unusual because the company wanted to significantly increase its bulk storage capacity without increasing the floor space of the existing warehouse. The site, in Brighouse, West Yorkshire, is located on a peninsula between the Calder River and the Calder and Hebble canal and cannot be extended. The only option, therefore, was to literally go through the roof! As you would expect from a company that has won a CBI ‘Fit For the Future’ award, Avocet Hardware’s success is due to the way it plans its growth strategy and constantly reviews the infrastructure required to support it. As a major supplier to the DIY industry – Avocet has to plan to keep pace with the phenomenal growth of its major customers. The extension to the bulk storage system is part of the process to satisfy the increasing demand for their range of window and door security hardware, fixings and fasteners and access and door control systems. Doug Howie, Avocet Hardware’s Operations Manager, takes up the story. 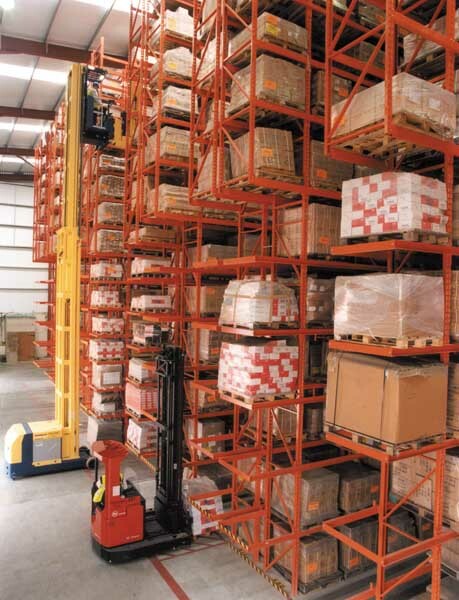 “We approached a number of racking manufacturers with a brief to provide a scheme that gave us as many pallet positions as possible.” He says. “The systems also had to be adaptable and flexible enough to cope with a mix of both standard and euro pallets as well as the special door bolt containers.” A door bolt is the complete locking assembly, which fits to a door edge and are shipped in 2.5 metre long crates. The layout consists of a block of predominantly narrow aisle racking, comprising nine double and two single runs. In the main each run is twenty five bays long, the bays having 2250mm of clear entry and twelve beam levels. Top beams are just over fourteen metres high. Four of the racking runs have 2700mm wide bays enabling up to six hundred of the special door bolt containers to be stored. Alternatively these bays can also be used to store either the standard or Euro pallets. 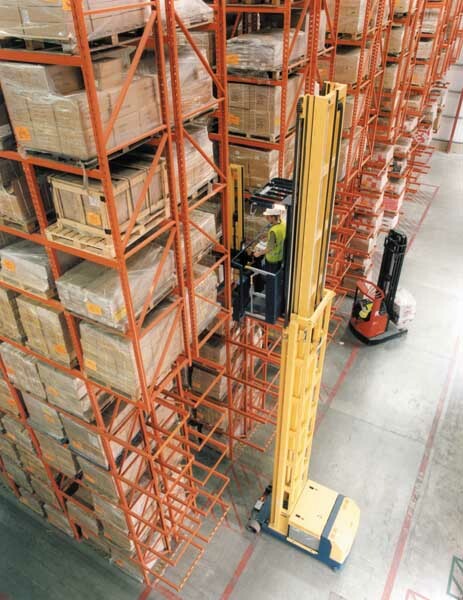 The aisles in this area are 3.5 metres wide to enable a wide carriage Reach Truck to manoeuvre the long crates. 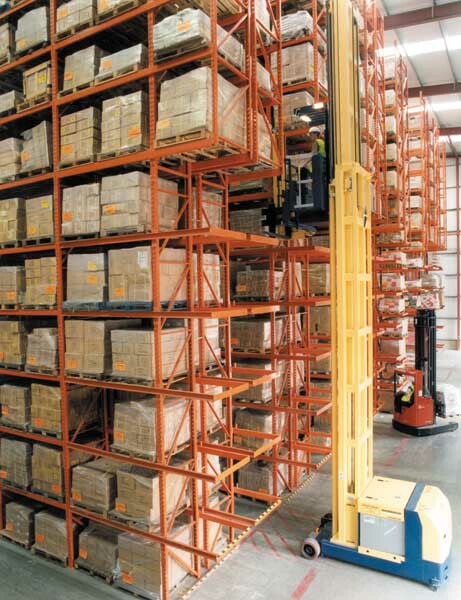 Throughout the rest of the scheme the aisles are 1925mm wide and three wire guided man up pallet stackers are used to service the racking. Due to the wire guidance system, pallets in the bottom locations are stacked directly on the floor. P & D stations, at the end of each run of racking, complete the installation. 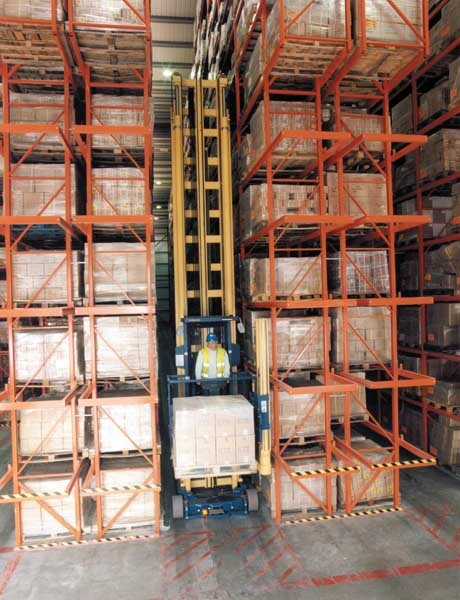 The net result is that the bulk store can now hold 9000 pallets, compared to 1800 previously, in the same footprint. This means that the new bulk store is considerably taller than the old one. A new shell had to be built around the racking. Due to the scheduling of the building works, the installation had to be completed in phases and the whole project took four months to complete.